On behalf of XTBG, Prof. Chen Jin extended spring festival greetings to them and their relatives, as well as to all foreigners making contribution to the development of XTBG. The 39 foreign representatives attending the symposium include Prof. Richard Corlett, Dr. Alice Hughes, and other researchers and students pursuing academic degrees in XTBG. They shared their life and studies in the garden. They also shared ideas and advice on the goal of “building XTBG into a first-class botanical garden in the world”. Over the past years, more and more experts and students from different countries work and grow on the ‘science island” of XTBG. The interactions of multidisciplinary studies become more and more active, which contributes to form international research teams. 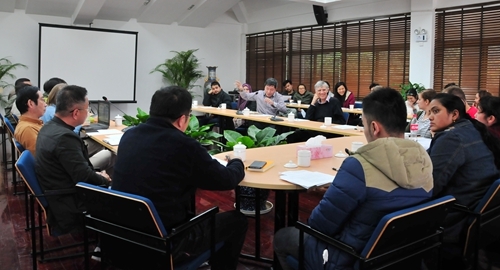 “XTBG has made great progress in scientific research, species preservation, science communication, and international cooperation, which results from joint efforts of XTBG staff and foreign expats”, said Prof. Chen Jin. A t present, there are 7 foreign experts, 12 postdocs, 50 Ph.D and M.Sc candidates from 23 countries working in XTBG. The foreign experts make up one seventh of research group leaders, foreign postdocs accounts for half of the total postdocs, and foreign students account for one sixth of the total Ph.D and M.Sc candidates in XTBG. 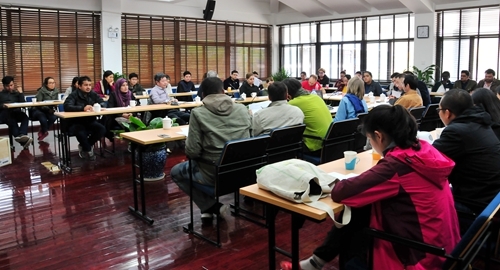 Prof. Chen Jin said that XTBG is trying to build a world first class botanical garden. We will continue to streamline administration and optimize service, so as to provide more favorable conditions for foreigners. “As a result, the foreign talents may contribute more to the team building of our science island”, added Chen Jin.